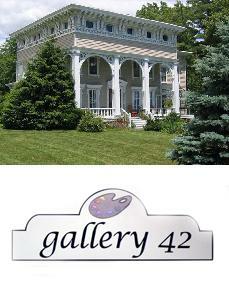 Gallery 42 is located in historic Catskill, New York; the home of Thomas Cole one of America's most famous landscape painters and the founder of the Hudson River School of Art. Cole's home and studio "Cedar Grove" is a National Historic Site and is located a few blocks from the Gallery. The gallery is housed in one of the finest examples of Italianate architecture in the entire Hudson River Valley. Built in 1860 by wealthy merchant Judd Olney the home has had many uses throughout the years including from 1905-1989 as a convent for the Sisters of Saint Francis. In 1990 it was lovingly restored back to it's original plan as a single family home. The gallery, which specializes in mid-20th century contemporary art, presents a striking contrast with its 19th century surroundings." The gallery is open on the third Saturday of each month from 4;00-7:00 pm and by appointment.